About this time [May 1952] Adam Currie returned from the Birmingham factory of the Dunlop Rubber Company (where he was a Management Trainee) to continue his training at their Head Office (which just happened to be next door to British Aluminium where Colin worked). Peter Ross (the author of this article) had completed his National Service (compulsory two years military service was in force at the time) and returned to his apprentice training with de Havilland Aircraft at Hatfield in April. He went back to being a paying guest at the house of Adam Currie's parents at Cheshunt. [Note: This has nothing to do with the later move of Lotus from Hornsey to Delamare Road, Cheshunt in 1959]. Adam's and Peter's parents had been friends before either was born. Adam has seen Colin racing at Silverstone with the Lotus Mk II and III and was keen to get into motor racing himself. Peter had known Colin and Hazel since 1948, so in May Peter took him over to Hornsey to meet Colin Chapman, and he decided to buy one of the two uncompleted Lotus III team cars, to be fitted with a Ford 1172 engine. This provided much needed cash to the Lotus cash-flow, but meant that there were now TWO customers wanting their cars before the end of the season! Time passed, and Adam got more and more irritated by the lack of progress with his car. Eventually Peter and Adam visited the Lotus works, to see the finishing touches being made by Colin, Michael and Nigel to the new Mk VI, which was fitted with the new Ford Consul engine reduced in capacity from 1508 to 1499 cc. "So that's why they haven't been making my chassis", said Adam. Peter decided that direct action was the only way, and arrived at Hornsey one evening with his overalls and toolbox. The Lotus team looked rather surprised when they heard the reason for his visit, but Colin was always quick to accept free labour, and soon they were sorting through bits and pieces in the loft. 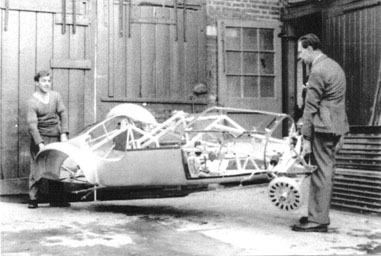 Most of the parts were still there, and it was just a bolting together job for Peter to turn it into a rolling chassis, with the result that the price was 'adjusted' downwards to GBPounds115! The Lotus Mk VI was finished and entered its first race on 5th July. Peter and Adam visited the works from time to time after that to get various little bits of welding done for Adam's car, and Peter remembers seeing the Mark VII having its engine mountings fitted. 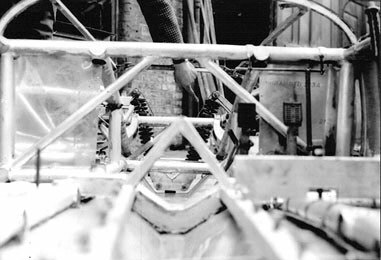 Because the Riley engine was so heavy, Nigel had turned it upside down and was lifting the chassis on and off the engine after tack-welding the mountings in place. This is a view from under the propshaft/driver's seat looking forward. The engine is not in place and you can see the front suspension. The cut off upper tubes can be clearly seen at the top of the photo. This is perhaps a good moment to look at what has already been written about this car. There are really only three "histories" of the early years that historians rely on to know what happened at the time. The first is a series of articles which started in November 1954 written by Colin himself for Motor Racing magazine. There is no mention of the Lotus Mark VII. The next book was written by Ian Smith in 1958 with the title "Lotus - The First Ten Years". The Lotus Mark VII is subjected to some "creative history", because it is said that Colin and Mike [Costin] deliberately did not use the number and kept it for a successor to the Mark VI. When you realise that Mike Costin had not even met Colin at the time the Mark VII was sold to Clive Clairmonte, it just shows how careful you have to be with what is written in books! The final book is the one written by Gerard "Jabby" Crombac in 1986 called "Colin Chapman - The Man and his Cars", and here at last we get what now appears to be the truth: On page 36 he quotes Denis Jenkinson, the famous "Motor Sport" motoring correspondent: "Colin .told us about a project he had been offered by a man called Clairmonte who had been racing a 2 litre 6 cylinder Riley. This chap wanted a single seater Formula 2 racing car and asked Colin to design it for him. He told us his ideas for this front-engined Formula 2 car which sounded very ambitious for a 750 Club member who had only ever built Austin Seven specials. We could not enthuse over this project as we thought the whole basis of designing it round a 1936 Riley engine was wrong. We reckoned the engine would not be powerful enough to be competitive and was too heavy for the power unit anyway." Forty years later I asked a respected restorer of vintage Riley cars, Barrie Gillies, what he thought: "A 2 litre Riley engine, with 6 carbs running on alcohol should produce about 160/170 BHP for a weight of about 295 lbs. Probably about the same power to weight ratio as a Bristol engine, so I don't understand what Jenk's problem was". Confusion was further added by Dennis Ortenburger in his book "The Legend of the Lotus Seven" who wrote: "In early 1953.[sic]. Chapman received an enquiry from two brothers by name of Clairmonte.......[who] would provide an ERA engine and suitable gearbox. Lotus to design body, chassis and suspension.. A rolling chassis was completed and delivered. The ERA engine had blown up before installation. It was then fitted with a Lea Francis engine." It is easy with hindsight to see where the red herring of an ERA engine came from. Clairmonte's Riley Special was known as the Kelly IRA, and these two initials are easy to confuse. Reference to TWO brothers being involved was probably due to their joint ownership of a company and for tax reasons it may have been ordered in the company name, but brother Ted was not interested in motor racing. Engines for the famous ERA racing cars were based on the six cylinder Riley engine, and the crank cases were made in the Riley factory. However ALL ERA engines were supercharged, and had a cylinder head with many more attachment studs. To run an ERA engine unsupercharged would be totally unproductive. person at the other end. We now know that the chassis had not reached the rolling stage, let alone having a body, when it was collected by Clive Clairmonte. © 2002, Peter Ross, Photos © as indicated. Reproduced with permission.